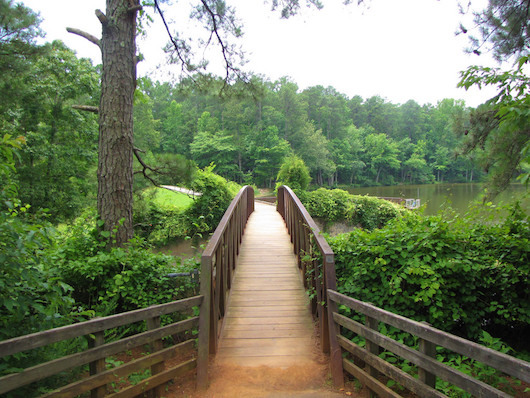 A 5,400 acre park 10 miles northwest of Raleigh, between Raleigh and Durham. There’s something for every runner on the 20 miles of trails, from wide bridle paths to narrower, more technical trail running. Some trails are forested, while others go by meadows or one of the three man-made lakes. There are good hill options too. There are trailheads on both sides of the park: the Crabtree Creek entrance is off Highway 70 and the Reedy Creek entrance is off I-40. Some particular trail recommendations below. See trail map and list for more info. Sycamore Trail. 7.2 miles RT. Follows Sycamore Creek much of way. Crabtree Creek entrance. Trail running. Sol’s Branch/Oak Rock loop. ~3.5 miles RT. Crabtree Creek entrance. Trail running.